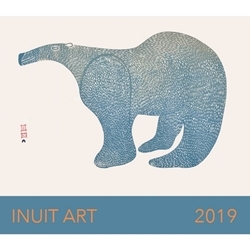 The 2019 Cape Dorset Inuit Art Calendar celebrates the work of twelve outstanding Inuit artists. High-quality photographic reproductions of original prints by the legendary artists Lucy, Pudlo and Kenojuak are among the twelve works featured. Images show the front and back covers of the calendar measuring 12" high x 14" wide.